Finally we have a sale this year above the $1 million mark on Delavan Lake. And it only took until the end of August. Last year, we had sales above the $1 million as early as April. The most recent purchase, located at 3331 South Shore Drive, took a long and exhausting path of price reduction after price reduction to get the job completed. Initially listed for a ridiculous $2,900,000 in October of 2008, this six bedroom, six bath, Frank Lloyd Wright look-alike was finally chopped to a more reasonable $1,295,000 before accepting an offer for $1,200,000. Resting on 1.3 acres with 140 feet of prime lakefront, the home is an attractive Prairie Style knock off with over 5,000 square feet of living space. 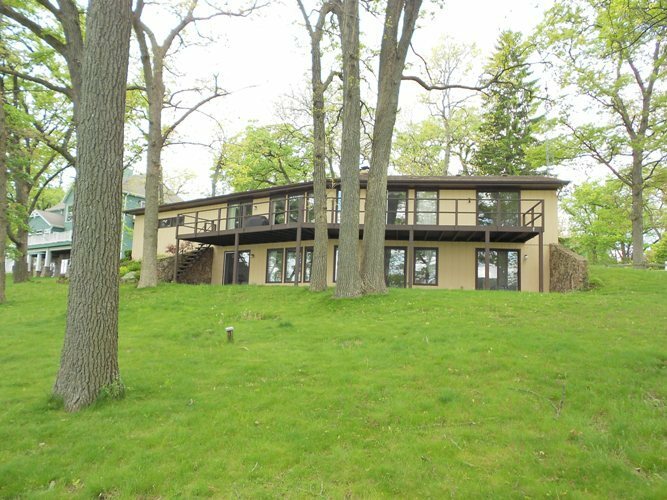 Deferred maintenance and a choppy floor plan held buyers back on this lakefront until a reasonable listing price was established. The dated Delavan Island walk out ranch, with a dilapidated boat house and extensive views has finally sold. Coming on the market for $999,000 back in February of 2011, this home drew curiosity seekers wondering if the old camp property could be brought back to life. Many buyers passed on a purchase after witnessing the condition of the boat house and the dated interior. There were a number of redeeming features, however, including 172 feet of lake frontage and spectacular lake views from the boat house. The boat house, however, blocks the views of the main house and the primary structure sits far back from the water. Also, the frontage is not as desirable at the rest of the main body due to the amount of vegetation on the neighboring lakefront. Offering three bedrooms and a walk out lower level, many buyers were also turned off by the lack of a driveway and shared access over the neighbor's property. The sale price of $700,000, while looking to some like a steal, takes into account many of the shortcomings of the property and the investment that will be needed to restore it to a level acceptable to most lakefront home owners. Starting at $1,250,000 the poorly designed Delavan Lake spec home at the end of Glen Eyrie has finally sold after four years on the market. Of course the sales was at a substantial discount from the profit driven original price. Glen Eyrie used to be part of the Buzzell Farm and was divided into a subdivision in the 1960's. The lot at the end of the road was to be reserved for homes on North Shore Drive to enjoy and was not intended to be built on. 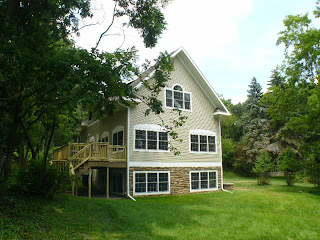 Lawyers will be lawyers, however, and money here and there resulted in building permits being issued for a spec house with many design flaws and little appeal to the typical lake buyer. The home had no master suite, no garage, no direct walk out to the lake and shares its frontage with seven other homes. All of these families have the right to walk in the front yard and use the pier at any time. Additionally, the home is only allowed one boat slip unless others in the association agree to allow a second. These are not generally features that one wishes to purchase for $1,250,000. With a series of reductions, the home finally found a buyer at $775,000; right near the assessed value of $789,000.